Chains are the parts which are needed the most to run a saw. No matter what saw it is. You need a good chain to cut branches properly. Sunrise Global Marketing manufacturer has made a chain that has incredible features as well as durability. The chain is named GreenWorks 29072 Replacement Pole Saw Chain. It is the best replacement of GreenWorks pole saws/chainsaws. The chain has 8 inches in length. This is a familiar length of the pole saw chains. The length is very good for cutting medium-sized branches. It can also cut some of the large branches of your garden. The chain comes from the reputed brand which allows the user to trust in it. It will boost the saw to provide more power on cutting. The chain is a genuine replacement product. So there is no confusion whether it’s a replica or not. 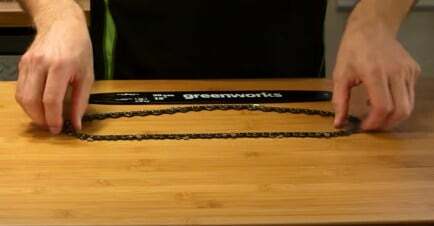 The replacement chain from the GreenWorks is, of course, a good one on the market. Generally, you see on the market that 8 inches chainsaws are mostly available. But that number doesn’t match with the number of chain availability of those saws. But here you got one. The chain is not only rare but also it will deliver good cutting performance with its sharp cutting ability. The chain comes with the feature of cutting fast and accurately. As it has got the 8-inch famous cutting chain, it will help you to cut the ugly branches of your garden accurately. There are many branches which are hanging in a difficult place. You might get there but cutting would be really difficult there. With this chain, you don’t have to face such issues. You can get there and cut too. It will save your time by its fast cutting rate. The chain is exceptionally sharp. It will cut through the limbs and branches like they are butter. Even it will offer the chance of cutting logs which are not that much thick. All of these extraordinary abilities are possible because of its exceptional sharpness. If you are suffering from the dullness of your saw, replace the chain with this one. You will again start to believe in your existing saw. Fitting is the most crucial thing to consider when you are buying a replacement chain. This chain is available to fit with most of the chainsaws/pole saws which contain the 8 inches chain. According to the manufacturer, the chain will work on GreenWorks saw models that include 20672, 20302, 20192, 20352 and so on. The compatibility of the bar is only with the 29062 model. Solution: An user said that his chain lasted only for one day. It’s very disappointing that a well-reputed brand’s chain only lasted for a couple of hours. But you cannot blame the company. They have made it very well as the specification is saying. Therefore, the chain should last for a long time. It might be your fault too that the chain did not work. Maybe the install process was wrong. Or the position was wrong of the chain. Buy another replacement for your chain. Before setting up the chain, check your manual to know the actual process. It the process goes fine, you chain will last for a long time. Solution: Another complaint of the saw was the dullness. It came as a dull saw for some users. They have faced different problem due to the dullness of the chain. It’s a sharp chain. But different things can make it a dull one. If you got a dull chain, you should sharpen the chain. There are several methods of sharpening a chain. You can follow any of those methods. Check the necessary tools are with you or not. If the chain gets right amount of sharpness, it will work properly and provide sharp cuts. Q. What diameter file is needed to sharpen this GreenWorks chain? A: The diameter of the file should be 5/32 inches. Moreover, the file must be a round shapefile. Q. Will the chain work with the Kobalt 8 inches bar 40-volt pole chainsaw? A: Yes it will work with two models of Kobalt. These are Kobalt 40v pole saw model 50689. Another one is Kobalt 40v pole saw model 796791. Q. Can I use the chain for Greenworks # 20102 bar? The specs are 8 inches bar and chain of the saw. A: Yes you can use the chain in your saw. But make sure you are putting the chain in the right direction. GreenWorks 29072 Replacement Pole Saw Chain is a quality chain from the Oregon brand. It has got its reputation for the impressive performance and features. The chain is compatible with different models of GreenWorks saw. The chains and bars which normally come with a pole saw or chainsaw is not that durable. There are many reasons behind it. Let’s not go to that topic. When the chain of your saw has stopped working, you got nervous about buying another chain. Because of there a many varieties among the chains on the market. It’s normal to be confused. So if you have any GreenWorks saw, be sure to buy one of these chains. You will feel the need of buying it in the future. The GreenWorks user should have bought this one. No one can say when your existing chain stops working. So it will be a good choice to buy a replacement chain. As the chain has numerous features, you will be super comfortable to use the chain.